Vintage 1975 photo Carlos Reutemann / Carlos Pace - Alfa Romeo Brabham F1 BT45B - Balocco - 512 1940. 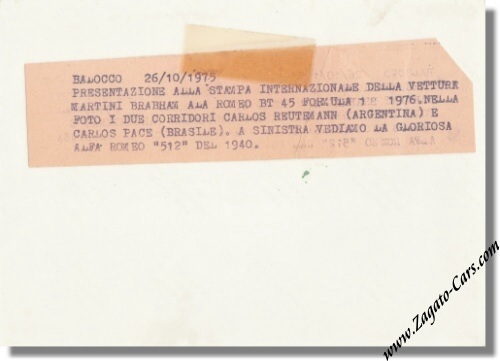 This is a vintage & original 1975 photo of Carlos Pace in the then-new Brabham with Alfa Romeo engine and Carlos Reutemann in the 1940 Alfa Romeo 512 racer. 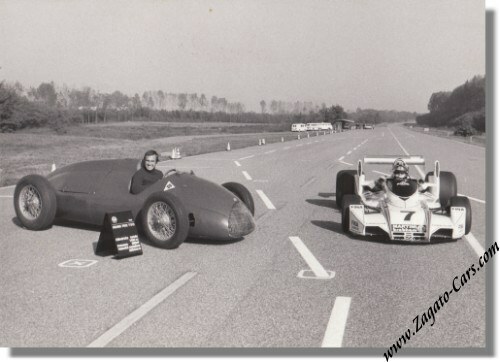 The photo was taken at Alfa Romeo's test track "Balocco" in preparation of the 1976 season in which Brabham would run the Alfa Romeo 3.0 liter F12 engine. It measures some 6.75 x 5 inches (17 x 13 cm) and is black & white.